We’ve all had times when we worry, usually unnecessarily, that someone is talking behind our backs. But one man who should have worried more is Lord Castlereagh. By 1809, Foreign Secretary George Canning had become disillusioned with the government, writing that “the government as at present constituted, does not appear to me equal to the great task which it has to perform.” Led by the Duke of Portland as Prime Minister and Spencer Perceval as Leader of the House of Commons, the government had already mishandled the ‘Duke and the Darling’ scandal involving Frederick, Duke of York, and his mistress Mary Anne Clarkes’ trafficking of army commissions. Increasingly frustrated at being part of a government he believed to be ineffective, Canning pressed for reform. In April he threatened to tender his resignation unless changes were made, namely the removal of Lord Castlereagh from his position as Secretary of State for War and the Colonies. Castlereagh had been ill for months and Canning thought that he was mismanaging the War Office, but a change would also benefit the ambitious Canning on a personal level. He suggested that Lord Wellesley, a supporter of his, replace Castlereagh. The Prime Minister was elderly and he had never been a firm man. Unwilling to lose Canning, he agreed to remove Castlereagh from the War Office, as did Castlereagh’s Uncle and fellow statesman Lord Camden. The Prime Minister, Castlereagh’s Uncle, and fellow minister in the Foreign Office George Canning, had all decided that Castlereagh would be replaced. Unfortunately, no one had bothered to tell him this! First the Duke of Portland assured Canning that he was asking Castlereagh to accept another office (the Government of India), but he put off telling Spencer Perceval (The Chancellor of the Exchequer and Leader in the House of Commons), who explained that no changes could be made to the cabinet because a plan had just been approved that Castlereagh would have to see through. Meanwhile, Lord Camden had assured everyone that his nephew had agreed to the proposed change, when poor Castlereagh was, in fact, completely unaware. Canning learned of the deception himself in mid-July, wisely guessing that in the end he would be blamed for it. A few months passed in which nothing was done before Canning attempted to resign. Not only did King George III refuse to accept it, he also forbid the Duke of Portland from saying anything about the planned change of office to Castlereagh. The Duke of Portland was further silenced by a stroke in August. So the all-important plan that Castlereagh had to see through went ahead. The campaign, an expedition to the Netherlands in hopes of assisting the Austrian Empire against the French, was a disaster. British troops seized a swampy island called Walcheren, but they began to suffer from Malaria. In early September the expedition was called off, but not before 4000 men had died, only 106 of them in combat. The failed campaign cost the government eight million pounds. With the Prime Minister’s health precarious, the ambitious Canning thought he would be asked to form a government next, but he was passed over for office in favour of Spencer Perceval. This time Canning did resign, remaining Foreign Secretary only until a successor could be appointed, but he didn’t attend a cabinet meeting on September 9th. Noting the absence, Lord Castlereagh asked his Uncle why Canning wasn’t there and Lord Camden finally told him (likely leaving out the whole part where he assured the cabinet that his nephew knew about and approved of the plan), about the maneuvers that had been taking place behind his back for the last five months. 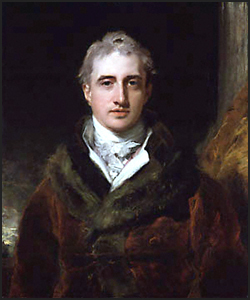 Nine days later Lord Castlereagh challenged George Canning to a duel. Interesting. I like that line “the government as at present constituted, does not appear to me equal to the great task which it has to perform.” I’ve often thought that of our current gov’t! George Canning had a problem with holding his tongue sometimes but he was undoubtedly an intelligent man and a great orator. I liked that line as well. I actually own a copy of The Madness of King George. Generally I thought it was quite well done. Did you see “The Madness of King George”?